Jess & James, c'est un peu la soul à l'heure de Communauté Européenne: Portugal - Belgique - Espagne au son des cuivres! 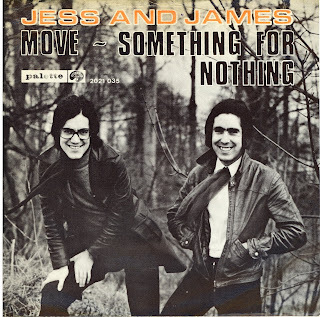 Jess and James were portuguese born singers from Belgique, their real names are Antonio and Fernando Lameirinhas, and their backing band was the JJ Band. They did some great cut of "euro"-soul, like the awesome "move" wich was sure to packed any dancefloor in Belgique, Netherland or Spain in 1967! and it still remains so fresh and so powerfull nowadays!